I’ve been a bad blogger recently, what with the infrequent updates and all (though I’m still writing regularly over at Serious Eats), but even after spending a busy day writing about booze and a busy evening judging a cocktail contest for Domain de Canton (congratulations, Jay! ), I’ve still got to log in to WordPress for two basic reasons: first, it’s Mixology Monday, and I have yet to miss a MxMo post in the three-plus years it’s been going (we’ll ignore that whole “isn’t Paul hosting the July event?” thing from this summer, when I foolishly offered to host right after Tales of the Cocktail); and two, this event is hosted by Vidiot at Cocktailians, and he has selected a topic that’s truly close to my drinkin’ heart: Vermouth. In addition to writin’ about vermouth and talkin’ about vermouth at events like Tales of the Cocktail, I’m a fan of drinking vermouth — both on its own as an aperitif while I’m cooking dinner, and in big glugs or tiny dribbles when making cocktails. But there’s one thing I wish there was more of in this world: cocktails that used vermouth as the primary ingredient. Oh, sure, there are the assorted aperitif cocktails — your Bamboo, your Adonis, and things of that nature — but drinks that use the mild character of vermouth as a foundation for stronger-flavored spirits and liqueurs are relatively few in number. 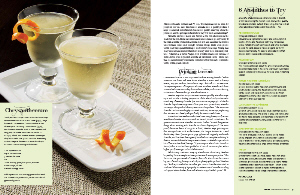 I’ve already written about a couple of my favorite vermouth-based drinks, the Trilby and the Appetizer a la Italienne; here’s another that was introduced to me by Jim Meehan from PDT, a drink I touched on a couple of years back in an article about absinthe I wrote for Imbibe (the photo of this drink that accompanied the story is shown in this screen shot, and was taken by the immensely talented Stuart Mullenberg — I’m showing it partially because it’s freakin’ awesome, but also because I’m way too lazy to set up a photo after such a long day) and that I still like to pull out from time to time: the Chrysanthemum. I’m hardly the first blogger to prepare a Chrysanthemum, but the drink is so damn tasty I hope I’m not the last. As I mentioned during our recent Vodka-oriented Mixology Monday, in drinks like the Chrysanthemum dry vermouth plays a role not unlike that played today by vodka in drinks like the Drink Without a Name or the Gypsy: it’s a relatively quiet ingredient that serves to diffuse the flavors of louder ingredients such as, in this case, Benedictine and absinthe. But unlike vodka, vermouth serves a couple of other functions: first, it’s lower in alcohol, so it reduces the bombast further, helping a combination of strong-flavored ingredients merge together; and it has its own flavor and complexity, which brings more to the bibulous table than simple alcoholic firepower — in this case, a kind of lean floral aspect that complements the herbaceousness of the Benedictine without challenging its alpha-dog properties. Anyway, don’t take my word for it — mix one and see for yourself. But a note on the preparation: the Savoy Cocktail Guide and other books of its vintage list this as a two-to-one vermouth-to-Benedictine drink. Depending on your taste, this may weigh in on the sweet side; Meehan recommended shaving the Benedictine back to a quarter-ounce, and your palate may find joy anywhere between those two levels — in other words, play with it until you find what works for you. Stir with ice and strain into a chilled cocktail glass. Deploy a large swath of orange peel over the drink and use as garnish. That’s where I like to go with vermouth-based drinks nowadays. Head on over to Vidiot’s place to see what other folks came up with for this round of Mixology Monday.